A World Class Collection for Free! The Chrysler Museum of Art offers so much for art lovers. And now, it's even better, because the permanent collection galleries are free. What could be better for a cheap family vacation spot? Personally, we love the stunning Tiffany windows, lamps, and blown glass (they have one of the greatest collections of glass in the nation). But this is a museum that even kids will enjoy. Anyway, this world-class collection offers pieces spanning 4,000+ years. The European collection reflects their major donor's passion for Italian and French painting. Enjoy works by Henri Matisse, Georges Braque, Thomas Cole, Winslow Homer, Mary Cassatt, and John Singleton Copley. Renovation News: The main museum has been completely renovated, so they have room to display even more art than before. Don't miss their Glass Studio with Free Glass Blowing Demonstrations! Love hot glass? Hop on over to Norfolk's Chrysler Museum of Art for free glass blowing demonstrations at their new Glass Studio. Free demonstrations are held Wednesdays through Sundays from noon to 1 pm, and on Saturdays and Sundays from 4 pm to 5 pm. They also offer ongoing glass blowing workshops. For details, click here. Free Concerts & Family Events! The museum offers free concert series most of the year. Warm It! is a series of concerts every Thursday night in February. Cool It! is a series of concerts every Thursday night in July. Art of Jazz a first-Wednesday-of-each-month music series features performers from across Hampton Roads. Sit in the atrium and enjoy fine jazz from 6:15 to 8:45. It's free! Free for families: The second Saturday of every month is Family Day (from noon to 3 p.m.) Bring the whole family for family-oriented music, art, and activities! Admission to permanent collections: FREE! There is a charge for visiting exhibitions, but even those are free for children 5 and under. Don't forget to visit the historic Moses Myers house nearby, which features period piece art and is also free! For details, go to the Moses Myers site. The museum also has a lovely gift shop, and a very elegant cafe, featuring delicious, gourmet cuisine. Hours: Wednesdays, 11 am - 8 pm; Thursdays through Saturdays 11 am - 3 pm; Sundays 12 - 3 pm. Recommended Itineraries, From a Cheap Kids' Day Out, to a Romantic Date Day! 1) Norfolk for (practically) Free Day! : Go to the Chrysler Museum of Art in the morning. Have lunch at Doumar's drive-in. 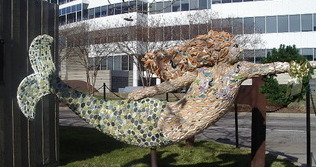 Download a free Mermaids scavenger hunt map and go on a Mermaid's scavenger hunt! 2) Cheap Kids' Day Out: Visit the nearby Virginia Zoo in the morning. Go cheap and eat at Doumar's, or splurge and have a delicious Lunch tea at Rowena's Tea Room. After lunch, indulge in a little culture at the Chrysler Museum. 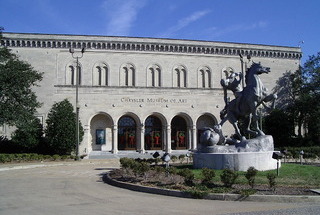 3) Romantic Date Day: Visit the Chrysler Museum of Art in the morning. Have lunch at Baker's Crust (don't forget to finish off with a delicious crepe!). Spend a few hours holding hands and walking around Norfolk's MacArthur Mall. Then, drive to Portsmouth's classy Art Deco Commodore Theatre for dinner and a movie! If you love art, you'll appreciate Richmond's Virginia Museum of Fine Arts. They have a world-class collection of paintings, sculpture, silver, and other decorative arts. They also have one of the world's largest collections of Faberge eggs and objets de luxe. You may also be interested in seeing the decorative arts in these historic homes: Maymont, Monticello, Ash Lawn-Highland, Mount Vernon, and the James River Plantations.